I hope everyone had a wonderful Thanksgiving, I know I sure did. I really enjoy getting together with my family that I don’t get to see as much as I would like. I am grateful for all the wonderful things I have been able to do out in the garden this past year, and look forward to the many great adventures to come! I don’t know if it is the weather, but I am slowly starting to turn my attention to the indoor gardening I like to call houseplants. In the past year, I have purchased quite a few, and I will be blogging about them in the near future. One thing I am very fortunate to have in my backyard is the Buffalo and Erie County Botanical Gardens. 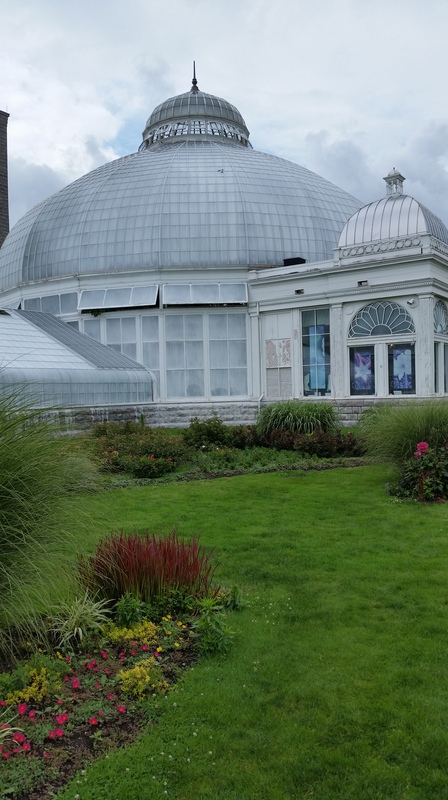 The Buffalo and Erie County Botanical Gardens opened in 1900 and is one of only a few left of its kind. 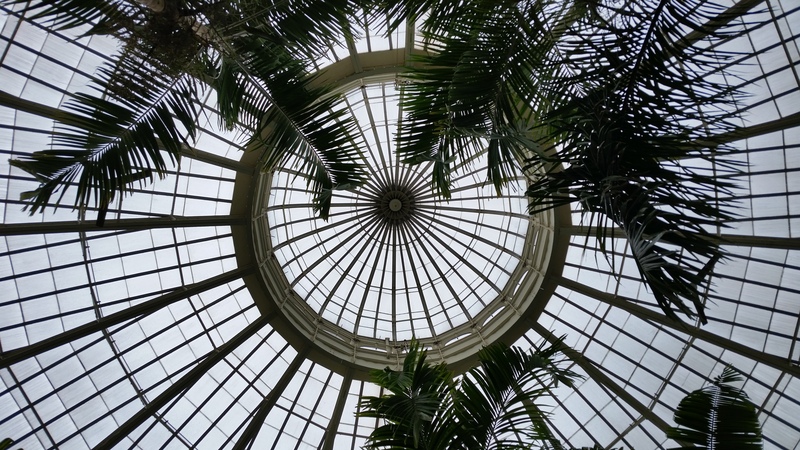 If you live close to a botanical gardens, they are great to visit this time of year. When it’s cold and the snow is blowing, you can escape for a little while to another world that is lush and green and warm! Not only that, but you can get some great inspiration from a place like that! I take pictures of the plants I like and look them up on the Internet. Some of them I have found at my local nursery! Or, you just get wowed by some of the most unusual plants in the world. 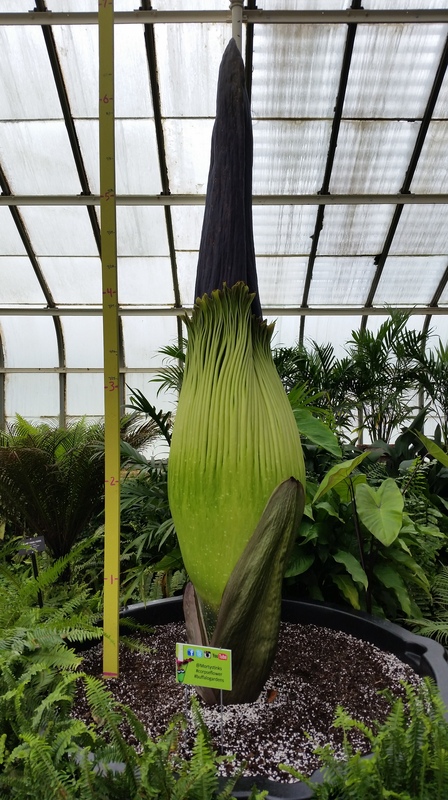 In August, I had a once in a lifetime opportunity to observe a Corpse Flower bloom at the Botanical Gardens. What is a Corpse Flower you ask? It is the largest single blooming flower in the world. It can reach 20 feet in height! When it blooms, it emits an order that is equated to rotting flesh, hence the name Corpse Flower. That odor is what attracts pollinators. It takes them 7-10 years of growth before they bloom. And when they do bloom, it only lasts 24-48 hours. Sounds awesome, right? I know some people may not like the sounds of it, but it really was awesome to see. Now, here is the Corpse Flower one week later. You could see all the flies that were attracted to that rotting stench! This is just another great example of how amazing nature really is, and just what it can do for your garden aspirations. Looking “outside of the box” of gardening can breed garden creativity you can only imagine. So, get out of your garden comfort zone today to create an other-worldly garden tomorrow!